Sebastiano Vitale was perched facing backwards on a quad bike, tearing across a vast field in Argentina. He clutched his camera closely as 500 polo ponies streamed around him. 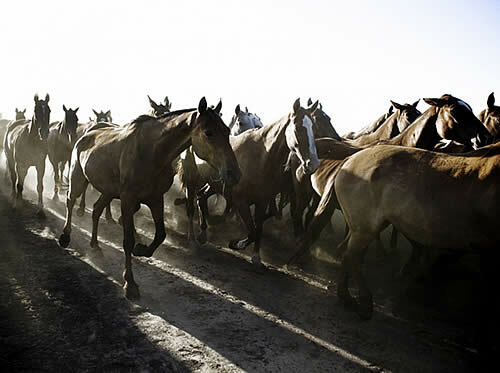 These dynamic horses and ponies lead to powerful images shot by Vitale, an artist and photographer from Torino, Italy. He has created art his entire life, including everything from commercial works, to luxury projects, to human rights issues and horses. The artist began his full-time, professional art career in 1998 and took up photography in 2010. “I only took one half hour photography class and the rest came naturally,” Vitale states. Vitale said the technical aspect of capturing photos is very simple but composition is instinctive. He said the instinct “can be tamed, but it cannot be taught.” After working with music, video and mixed media for many years, photography is now Vitale’s main medium. Although Vitale loves to ride, he said he isn’t very good. Despite this, he has spent a lot of time documenting horses and their behaviours. Vitale has now created many projects about horses and the culture around them. He said one of his most interesting projects documented the launch of Team Israel. He captured images as the team prepared for their first appearance at an FEI show in Wellington, Florida. The photos shot in Wellington were featured in part in The Washington Post. Vitale said that when working on projects such as that, the most important aspect is to have empathy with the subject and remain understanding of different personalities, be it human or animal. Empathy and patience were skills Vitale had to exercise on numerous occasions, including that of speeding along on a quad bike, while capturing images for “The Raw Horse.” Photos capturing “the most beautiful creatures in the animal kingdom” have led Vitale on a great photographic journey. “The Raw Horse” aims to represent the relationship between horse and man and was, in part, inspired by Gulliver’s Travels and its critique of 16th century Western society. Vitale said the story represents a higher form of civilization and that is what his Raw Horse project represents to him. Born and raised in the countryside, Vitale has always been exposed to animals and nature leading him to regard them as pure. He said this relationship to nature is reflected in his work, especially in projects such as “The Raw Horse,” which he describes as a stepping stone in his professional artistic career. When taking pictures, Vitale aims to capture not the actions, but the feeling of a moment. He often uses blurred images to demonstrate the process behind an image. He has to take time to foster a relationship with the animal before capturing its image. As Vitale approaches the subject with photography as his end goal, he creates a tension with the horse. He said he is not a horse person and often, horses are scared in the beginning, then curious and eventually they relax. As an artist, he has a wild nature and no logical explanation for why he does what he does. He explained that his parents ask the same question! For Vitale, the horse is a symbol of freedom, beauty, strength and poetry. See more of Sebastian’s work at www.therawhorse.com.